Jennifer Ingham went through the ‘Catholic Church Towards Healing’ process. She was awarded a record lump sum payment at her facilitation meeting in Brisbane in May 2013. Peter Kelso acted for Jennifer at the facilitation. Peter encouraged her to speak to the Royal Commission. Jennifer was asked to be a public witness in the Case Study 4 hearing in December 2013. Peter also represented Jennifer at the hearing. 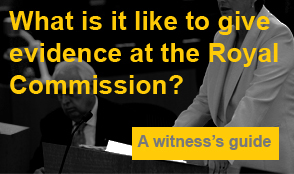 My experience at the Royal Commissions Public Hearing was difficult and confronting. I felt I had been exposed to my core. I was able to put my fear to one side. Why? I knew this was my chance to tell the truth to everyone who needed to hear it. I am so glad I did. During the ‘Towards Healing’ process I met a very kind and good man in my solicitor in Peter Kelso. I realised I was in the hands of a solicitor who absolutely understood my intentions. I knew I could leave Peter to take care of the legal matters so that I could concentrate on myself and my family. He propped me up when I needed it. When Peter encouraged me to write a submission to the Royal Commission to help others understand the process for a witness, I was grateful for the chance to help. Peter and his team are strong advocates for victims like you and me. Kelso’s are passionate about the need to expose those criminals within institutions who violate and abuse children. They are even more passionate about assisting victims like me to seek redress. Peter and his law firm want to make an impact, to make sure that the recommendations of the Royal Commission will lead to law reform. To make sure that victims receive a compensation they deserve. To make sure this era of depravity being exposed does not ever return. I now know that it is vital for victims like me to tell our story to make sure this never happens again. How will people react to you if you give evidence? I wasn’t prepared for the impact that the hearing had on my friends. Most of my friends had only limited knowledge of what happened to me. But after giving evidence at the Royal Commission, word travelled fast. The support I received was positively overwhelming. Even strangers sent me messages to say “you are doing the right thing…be proud”. As well as appearing as a witness I also had two private sessions with Commissioners before the public hearing. The Commissioners and Peter’s team put in so much effort to make sure I did not feel daunted before these meetings. The level of care I received was heart-warming. I could not have dreamt of anything better. The Royal Commission took care of my expenses including my flights and accommodation. All of my arrangements were taken care of so that my attendance at the hearing cost me nothing. What happens afterwards? How do you move on?